University of Illinois microbiologist Brenda Wilson discusses the rise in MRSA infections. Recent headlines have highlighted the spread of methicillin-resistant Staphylococcus aureus (MRSA) infection in the U.S. This bacterium is resistant to several commonly prescribed antibiotics, and an infection with a MRSA strain can be deadly if left untreated. 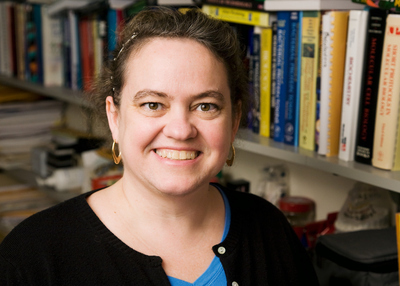 University of Illinois microbiologist Brenda Wilson discusses the rise in MRSA infections in an interview with Diana Yates, life sciences editor at the U. of I. News Bureau. At one time, drug-resistant staphylococcal (so-called staph) infections occurred mainly in hospitals, but community-acquired MRSA infections are on the rise. Do you think community-acquired MRSA will become a bigger problem? Yes. Once you get a bacterial strain that can survive better than others, it is going to spread. And, considering the amount of travel and increased opportunities for exposure that we have nowadays, I think this is a natural process that you would expect. Although most community-acquired MRSA bacteria are not as resistant to antibiotics as the hospital -acquired MRSA strains, the recent strains that we are hearing about in the news appear to be more virulent. Of course, the danger will be when the two types of staph acquire traits from each other. Since we cannot get around the fact that it is spreading, we need to think more in terms of containment, stopping transmission and controlling our risk to it. Most people harbor staph bacteria as a part of their normal skin microbes. This is normal staph, not MRSA. However, about 2-3 percent of people are carriers of MRSA strains. Staph bacteria can survive on surfaces very well. They survive on clothing, towels, combs and gym equipment. The best protection is to wash your hands frequently. Do not share towels or clothes, and especially do not share razors. Do not share anything unless you have washed it first. If you have a cut or an abrasion, put a bandage on it. People should be aware how important it is to take showers after contact sports, or even after going to the gym. Schools should decontaminate shared sports equipment and locker rooms. Simple washing with a 10 percent bleach solution, or alternatively with a 20 percent vinegar solution, is good for decontaminating most surfaces, but beware the caustic nature of these solutions. How alarmed should people be? The bacteria will not hurt you unless they get inside you. Most people with healthy immune systems are not going to have a big problem, but people should be cautious and try to minimize their risks. This is why hand washing and showering is important. If you have a cut, abrasion or skin rash that looks infected you should probably get it checked out. If the infection becomes systemic, that is, if it gets into the bloodstream and travels throughout the body, then you have a much bigger problem. Some individuals are more susceptible to infection than others. Young children who do not have fully developed immune systems are more susceptible, as are older people who have lost some of their immune function or people who are already sick. If you are healthy and you take relatively good care of yourself, practice good hygiene such as hand washing, and reduce your exposure to objects that might be contaminated, you're probably going to be fine. Some microbiologists complain that Americans over-sanitize their homes. How could this be a problem? There is a theory, called the hygiene theory, which propounds that our immune systems develop in response to the microbes we have lived with. And because we are more sanitary now, we may not be developing our immune systems as well as we used to. Experimental evidence in animals supports this theory. If you have an animal that has never been exposed to a germ, that animal is severely immune-compromised. Even if that animal gets some of its immune function back by later exposure to germs, it will never regain the level of immunity of a sibling that has been exposed all along from birth. How do we balance the need to develop a healthy immune system with the need to protect ourselves from potentially dangerous microbes? Right now there is a debate about what is the best policy to recommend. But, we know that the biggest risk is in community settings where there is a lot of person-to-person contact. So, when you are dealing with large groups of individuals in the community such as at school or the gym, or especially in a hospital with a vulnerable population, I would be more cautious and focus on the hygiene. At home, or within your own small social group, you probably do not need to be as concerned. Hygiene is still important, but the risk is lower.